Read the Executive Summary of the Study's findings. After a year and a half of data analysis, study and public feedback from over 83 presentations, meetings and open houses, the Northside-Southside Study team has presented our recommended first phase project alignment for the City of St. Louis. We knew the best route for Northside-Southside should align with community investment strategies, serve area neighborhoods and residents, and provide pedestrian access to the National Geospatial-Intelligence Agency (NGA) West campus. 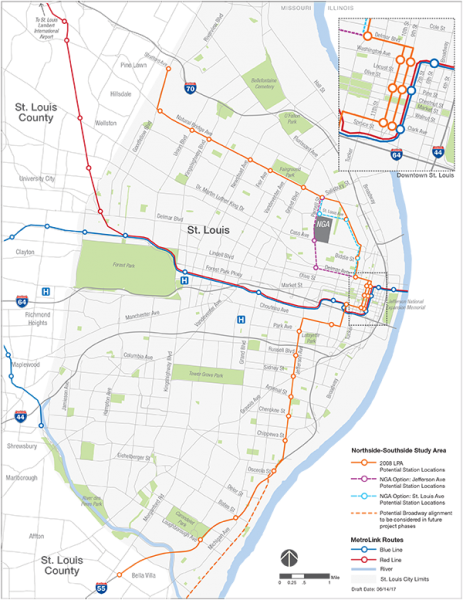 The study team recommended to the Board of East-West Gateway Council of Governments, our metropolitan planning organization, a $667 million street-running light rail investment that would run from Chippewa Boulevard in the South through downtown to Grand Boulevard in the North via one of the two North St. Louis alignment options. The Board of Directors approved the route for further study on August 29, 2018. See map below. 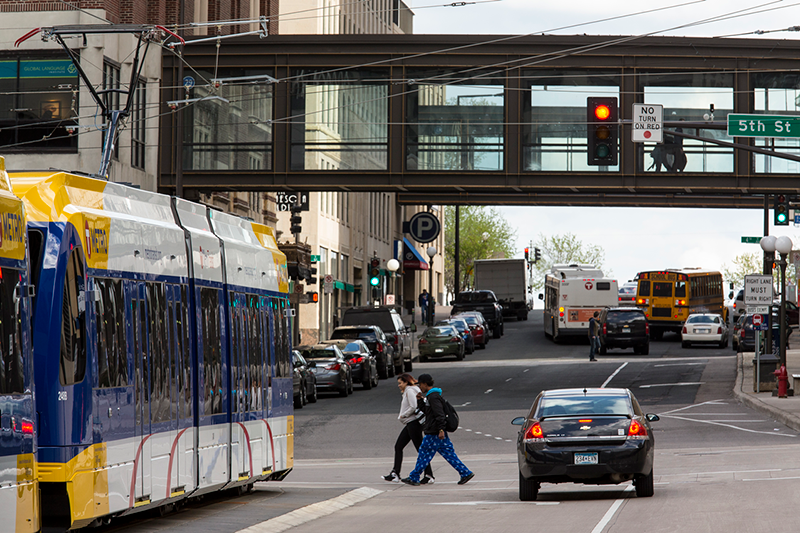 From public feedback gathered during the study, we knew any Northside-Southside route should align with community investment strategies and serve area neighborhoods and residents. Additionally on the Northside, the route should provide pedestrian access to the NGA West campus. Both the Florissant Avenue and the newly proposed Cass Avenue routes align with community investment strategies, including the Choice Neighborhoods Initiative. These options also serve the pedestrian entrances to the new NGA West campus, Carr Square and Old North neighborhoods. 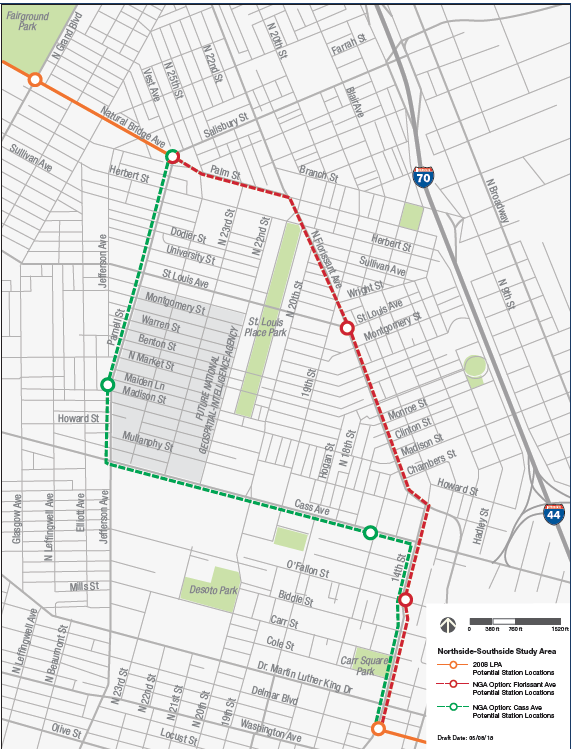 Although both options fulfill project needs and provide access to jobs, redevelopment and neighborhoods, the final north St. Louis route will be chosen during the next project phase, following additional technical work and community input. The map below shows the two Northside alignment options. The study team presented its final project recommendation to the East-West Gateway Board at its August 29th board meeting. The recommended route was approved for further study. The next step is to secure funding for an environmental study and project development, expected to take place during the environmental review process. At this time, a preferred alignment through North St. Louis will be chosen. Overall, we have seen and heard great community support for this project. 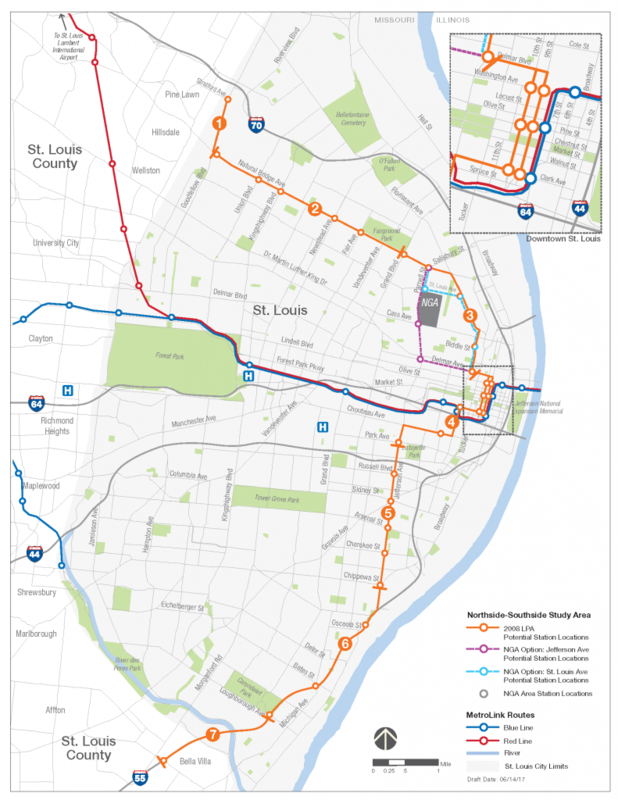 We know it will transform the City of St. Louis and St. Louis’ regional public transit system. Submit your comments or questions on the preliminary designs. 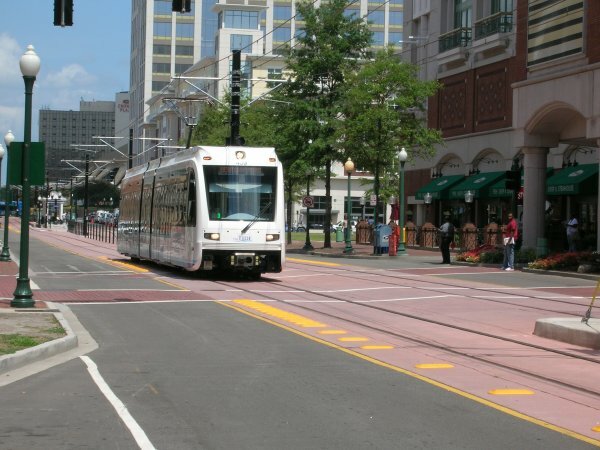 Northside-Southside will likely need to be built in phases due to budget constraints. 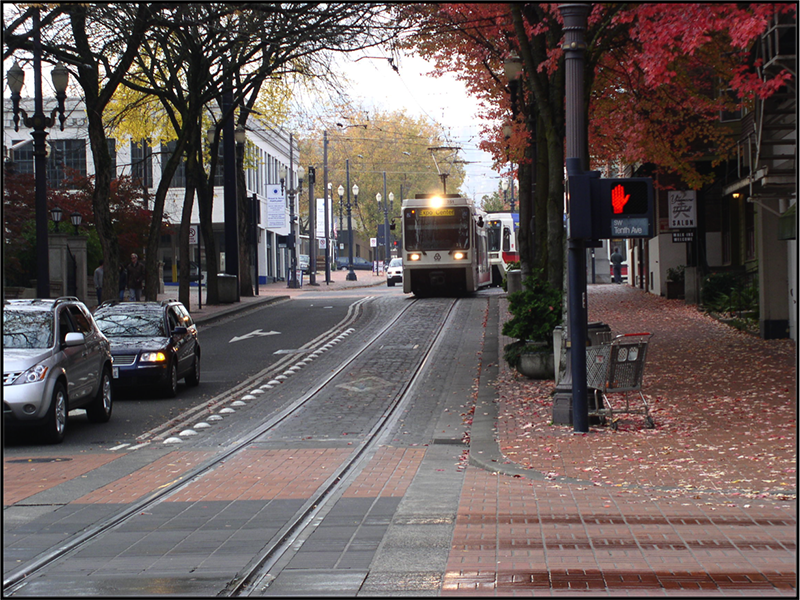 Breaking the route into segments can help the region's leaders and the community decide what could be built in the first phase. Click on the segment links below to view the detailed preliminary design maps. Light rail has the potential to transform the St. Louis region, especially in neighborhoods that need new investment and vitality. Northside-Southside is the vision for a street-running, modern light rail line that would encourage sustainable new development and investment in St. Louis' most underserved neighborhoods. It would also expand access to job and educational opportunities for thousands of St. Louisans, helping to make us a more prosperous and connected region. The 2017 Northside-Southside study will provide regional leaders information and public feedback to help inform public transit decisions. This study is also necessary to apply for federal transit funding to construct the proposed line. On-street light rail would transform St. Louis. This study will develop the plan we need.